If we believe you are having a heart attack, we will try to reach you as quickly as possible. When our staff arrive, they will assess you and may give you some drugs to relieve the pain. 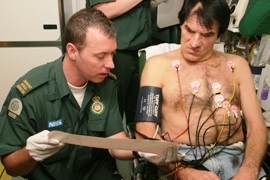 Unlike many ambulance services in the UK, our staff are trained to diagnose a heart attack using a piece of equipment called a 12-lead electrocardiogram (ECG). Using the 12-lead ECG, which records the activity of your heart, our staff will diagnose whether you are having a common type of heart attack, often called an ST-elevated myocardial infarction. If we find that you are having a heart attack, we will immediately take you for specialist hospital treatment. Read more about the work we’re doing to improve care for heart attack patients. If you are having a heart attack, you will not necessarily be taken to your nearest hospital. 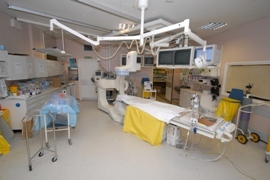 Instead we will take you to one of seven heart attack centres in London where a team of specialists will treat you. As a result you will receive the best possible level of care. An expert team at the heart attack centre will run a number of tests on you. If you are definitely suffering from a heart attack, you will be admitted for an emergency heart operation called primary angioplasty. Angioplasty is a procedure where a catheter is inserted into your artery and a small balloon then inflated to open the blockage. A small tube called a stent is inserted to keep the artery open. Angioplasty is recognised as the best possible treatment for a heart attack, and is successful in restoring blood flow to the heart in 95 per cent of cases. Most patients undergoing primary angioplasty leave hospital within three days. In most of the rest of the UK, heart attack patients are treated with thrombolysis, where they are given a clot-busting drug to remove the blockage from the artery. Thrombolysis is successful in 65 per cent of cases.